Read about the recent successes being enjoyed by Borderline members. If you are a member, we would like to hear about your recent success. You may have recently won or been placed in a competitive art exhibition, had a great sale or commission work, or simply wish to share the uplifting feedback you have received. Email Borderline Web-Co-ordinator with details. Raylee Delaney “She was a good cook”: 2nd Outdoor Scene. Tied 4th Peoples choice. Congratulations to The Artists’ Collective Studio (who are all Borderline members) who have won the Retail Award and HCs for Innovation in the Tenterfield Business and Tourism Awards 2017! Talented Borderline member Nola Sindel‘s watercolour painting “Graptoveria Big Brother” won the Peoples’ Choice award at the recent Botanical Art Society of Australia exhibition in Sydney at the Botanical Gardens. The Tenterfield Show results are in. Congratulations to the following Borderliners: Rosemary Boyle, Judy Harris, Theo Gard, Carmel Higgins, Louise Jenkins, Sue Jurd, Nola Sindel, Anni Washington, and Maryke Miller. The judge’s comments are available in the members’ only section. 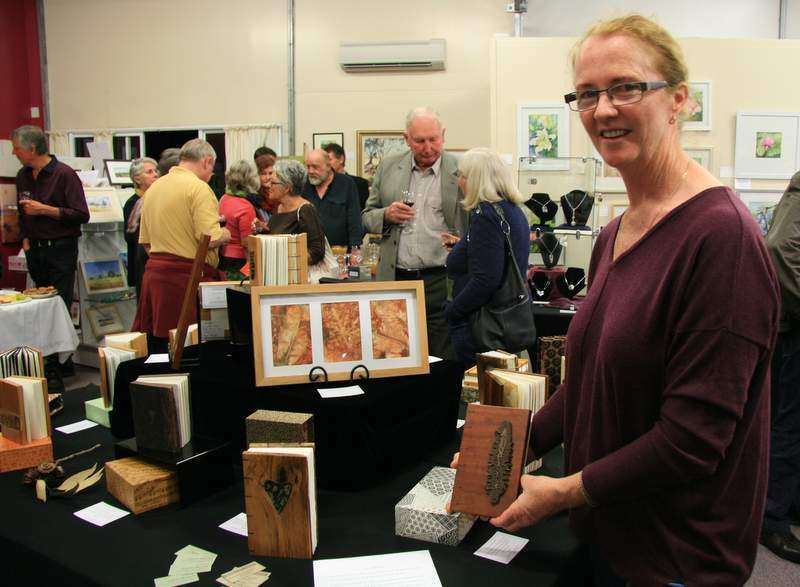 Borderliners John Donnelly (paintings and pots) and Jane Barrett (handmade books) are featured guest artists at the Artists Studio Collective, Tenterfield until June 2016. Borderliner Maggie Brockie‘s exhibition with Rod McIntosh ‘Common Ground’ is on at Inverell Art Gallery until 7 April 2016. The vibe at the opening of Common Ground was upbeat and buzzing. The curating of the exhibition by the vollies was excellent and certainly the WOW factor was evident when entering the gallery. Over 80 people – friends, family, and supporters attended. Although Maggie and Rod’s cultures are vastly different both artists are strongly connected to the earth; Maggie through subject matter and clay, and Rod with his connection to country through stories and heritage. Both artists were happy to have sold a few works each on opening night. Maggie gave a floor talk to 20 interested folk on Saturday morning, which resulted in the sale of another sculpture. 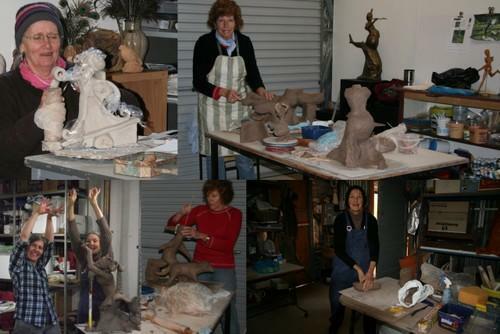 Maggie is conducting clay sculpture workshops at Stanthorpe and Glen Innes in March/April. Borderliner Judy Harris was awarded Champion (Best Work of Show), for her charcoal and pastel work ‘Woody’, winning work of the class ‘Drawing’. Other borderliners to meet the favour of judging artist Max Powell, were Louise Jenkins, Nola Sindel, Michelle Cockburn, Anni Washington, Margaret Oban Dowe, John Donnelly, Janet White, Maryke Miller, and Rosemary Boyle. The judge’s comments are available in the members’ only section. Borderliner Norm Clayton won both 1st and 2nd place in Oil Painting, with ‘Better than School’ and ‘Safety Beach’. Judi Pidgeon was awarded 2nd place in Watercolour for ‘Ginger Iced Roses’, and Elspeth Cameron was awarded 2nd place in Drawing for her ‘Heritage Apples’ triptych. Pottery results: Open: 2nd Janet White; Wheel-thrown Pottery: 2nd Janet White; Hand-built Pottery: John Donnelly; Primitive fired P. 2nd, Janet White; Sculpture: Maryke Miller. Congratulations to all entrants. Borderliner Gail Galloway won 2nd place in the section ‘Art Other Than Painting’ at the 2015 Bentley Art Prize, with her digital print ‘Earth Lines’ – later shown at Borderline’s ‘Resonance’ exhibition at Stanthorpe Regional Art Gallery. A scan of a handmade fruit fibre composition, ‘Earth Lines’ depicts the beauty and fragility of our environment currently under assault from mining especially coal seam gas which threatens fragile aquifers. Borderliners Maggies Brockie, Louise Jenkins, and Michelle Cockburn were all acknowledged by Armidale watercolourist James White. Click Inverell Art Prize 2015 for more information and photos! Borderliner Louise Jenkins was awarded Champion (Best Work of Show), for her acrylic ‘Uncle Ian III (Into the Unknown)’, winning work of the class ‘Figurative”. Other borderliners to meet the favour of judge Tanya Robertson-Cuninghame, were Nola Sindel, Linda Nye, Janet White, Maryke Miller, Pam Docherty, Rosemary Boyle, Sue Jurd, Lisa Sherratt and Anni Washington. For more information click on Tenterfield Show 2015. Borderliner Maryke Miller was awarded Most Outstanding Exhibit in the Stanthorpe Show 2015 for her pottery – a Blue Bowl. Borderliner Pam Docherty won 1st prize in Applied Art with her silver jewellery entry “Silvered Seed Pods Necklace & Earrings”. Borderliner Louise Jenkins won the Hangers’ Prize with her acrylic work ‘Quest for the Warwick Gold Cup’. Congratulations! 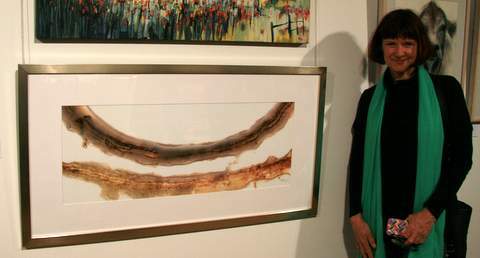 Borderliner Linda Nye was awarded the $1500 Tenterfield Shire Council Acquisition Award, for her painting ‘Spiritual Song of the Aborigine’. Other Borderliners to meet the favour of judge Helen Grant, editor of the Australian Artist, were Nola Sindel (Major Open Prize), Janet White (Minor Open Prize, and honourable mentions “Brush with verse (poem with artwork)” and “Interesting 3D exhibit”), Louise Jenkins (Regional Art Prize, and honourable mentions “Emerging Artist”, and “Interesting Interpretation of a subject”), Linda Clutterbuck (honourable mention “Interesting example of portraiture”). For more details, including the judge’s comments, click on A Brush with Verse 2014. Borderliner Linda Clutterbuck has completed her studies in Portrait Painting via correspondence with the London Art College. Congratulations on passing with Distinction! Borderliners John Donnelly, Gail Galloway, Louise Jenkins, Nola Sindel and Fay Roselt have works amongst those in the Stanthorpe Art Festival 2014 exhibition at the Stanthorpe Regional Art Gallery. The exhibition consists of works from each of Australia’s states and territories, plus works from the USA and Germany. Works were selected by judge Angela Goddard, curator of Australian Art to 1975 at the QAGOMA (Queensland Art Gallery of Modern Art). The exhibition is on until Sunday 13th April 2014. Don’t forget to cast your vote for the Public Choice Award, sponsored by Borderline. Borderliner Nola Sindel was awarded Champion (Best Work of Show), for her handmade book ‘A Little Book of Fungi’, winning work of the class ‘2D Construction’. Other Borderliners to meet the favour of judging artist Helen Grant, were Narelle Harvey, Margaret Oban Dowe, Louise Jenkins, Linda Nye, Rosemary Boyle, Gail Wilson, Shirley Caldwell, Sue Jurd, Gail Galloway, Nola Sindel, Janet White, Raylee Myers, and Pam Docherty. For more information click on Tenterfield Show 2014, or view the judge’s comments by scrolling to the bottom of the members’ page. Fresh back from tutoring her first watercolour class on the Gold Coast, Narelle Harvey was awarded ‘Commended’ in the Open Art section of the Inverell Art Society Competitive Exhibition 2013. Fresh from their successes at the Tenterfield Show 2013, Borderliners Maggie Brockie, Sue Jurd and Margaret Oban Dowe are taking their captivating exhibition ‘The Spaces in Between’ to the road. First seen in the Stanthorpe Regional Art Gallery, this exhibition will be in the Culliford Gallery, Toowoomba from 3rd March 2013. Borderliner Louise Jenkins was awarded Champion (Best Work of Show), for her acrylic ‘Kildare Granite’, winning work of the class ‘2D Work using Pigments (Contemporary)’. Other Borderliners to meet the favour of judging artist Thomas Spence, were Michelle Cockburn, Anni Washington, Margaret Oban Dowe, Sue Jurd, Narelle Harvey, Nola Sindel, Linda Nye, John Donnelly, Maggie Brockie, Janet White, and Pam Docherty. For more information click on Tenterfield Show 2013. Borderliner Louise Jenkins was pre-selected as a finalist, and awarded Commended for her contemporary landscape ‘Kildare Granite’ in the Norvill Art Prize 2012. The exhibition hosted by the Murrurundi Arts Council was judged by Kathleen von Witt, director of the Hawkesbury Regional Gallery & Museum. 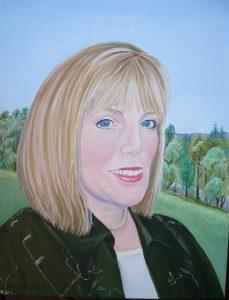 Visit The Scone Advocate for an image of Louise and her work. Borderliner Nola Sindel was invited to be feature artist at an exhibition of traditionally styled works for local and regional artists at Glen Innes Art Gallery. The exhibition was called ‘In Their Footsteps – A Traditional Exhibition’. Borderline member Kerry Cannon has his new sculpture “Crisis” in the 10th Annual Swell Sculpture Festival at Currumbin Beach September 14 – 23, 2012, a display of 50 sculptures built by artists from Australia and abroad. The free exhibition is open all hours with a selection of sculptures revealing a new verve as they are lit up under the southern sky. Borderliner Maggie Brockie opens her studio and shares her formidable clay sculpting skills in a series of simulating workshops where is seems anything is possible! Maggie is sensitive to the individual needs of her students, moving easily between raw beginners and her advanced students. The environment is warm and supportive, and the catering, fabulous! Check out these images from her July 2012 ‘Movement’ workshop. Borderliners Louise Jenkins, Nola Sindel, Lu Potter and Jean Braid all did well at A Brush with Verse 2012. Click on A Brush with Verse 2012 for more information. Following his success as winner of the Contemporary Art Special Feature at the Inverell Art Society Competitive Exhibition 2011, our president was invited to be feature artist at an exhibition of Contemporary works for local and regional artists at Glenn Innes Art Gallery. The exhibition was called ‘Dancing to a Different Drum’. Borderline was well represented amongst the winners at the Stanthorpe Show 2012. The Champion prize and ribbon was awarded to Laurie Astill for his piece ‘Eye of the Tiger’, winner of ‘Oil or Acrylic Painting’. Other borderline winners at the show included Nola Sindel, John Donnelly, Peter With and Ray Lee. For more information, including pictures, click on Stanthorpe Show 2012. Borderline was well represented amongst the winners at the Tenterfield Show 2012. The Champion prize and ribbon was awarded to Louise Jenkins for her charcoal piece ‘After the Fish’, winning work of the Drawing class. The work is one of 2 which were abstracted from the after lunch time plates of fish bones. Other Borderliner winners at the show included Nola Sindel, John Donnelly, Linda Nye, Sue Jurd, Shirley Caldwell, Gail Wilson, Jean Braid, Peter With, Jann Newman, Chris Humphreys, Margaret Oban Dowe and Janet White. For more information, click on Tenterfield Show 2012. Borderliner Linda Nye has an 8 page spread in magazine Australian Artist issue 332 (February 2012). The article includes information on her working methods, top tips on colour, and a step by step acrylic painting demonstration. Interestingly, two of the paintings pictured in the article were on display at the Tenterfield Show (27th – 29th Jan 2012). The judge, Penelope Hillam, director of Stanthorpe Regional Art Gallery, acknowledged both works – giving one a ‘Special First Prize’ in the sub-category ‘Traditional Landscape’ which was created at her discretion (and that of chief steward). We hope that the increase in exposure by the magazine will bring Linda Nye ever greater recognition. Now that the Shine exhibition is over, the votes for Peoples’ Choice have been counted. Linda Nye’s acrylic painting ‘Dust Stirrers’ is the winner. Congratulations Linda! Coming second was Louise Jenkins‘ acrylic work ‘Three Trees, Kilmarnock’, and third was Nola Sindel‘s coloured pencil drawing ‘Raptor’. 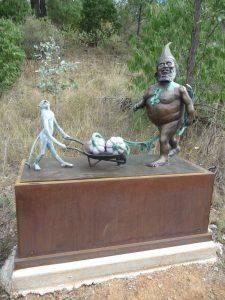 Nola Sindel won the $500 ‘Works on Paper’ prize at Armidale Regional Art Prize exhibition. This is the same work (pictured below) which won ‘Best Flora Artwork’ in Brisbane. Congratulations Nola! The exhibition is on at Armidale Gallery until 17 November 2011. 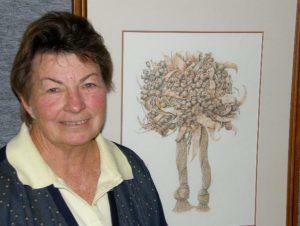 Borderline was well represented among the winners of the Inverell Art Society Competitive Art Exhibition 2011. Members John Donnelly, Nadia Varelle Kliendance, Margaret Oban Dowe, Maggie Brockie and Nola Taylor all receiving recognition for their work. Click here to read about our members’ success at the exhibition, and view images. Borderline artist Nola Sindel recently entered her drawing of gum nuts and leaves, titled ‘An Arrangement of Eucalyptus Fruits and Leaves’ in the Faber-Castell 150th Anniversary Exhibition in Brisbane. Her work was awarded ‘Best Flora Artwork’, drawing many appreciative comments from judges and visitors to the exhibition which was held at Mt Coot-tha Botanic Gardens. The piece was executed in colour pencil, and even though it appears as a range of browns, pinks and fawns, there were over 30 different coloured pencils used in the work which took over five weeks to complete. Nola specialises in botanical and wildlife art, generally in watercolour or coloured pencil with her works being exhibited regularly in Brisbane and in Borderline exhibitions.